Click to See CollectionImagine Faceted Eye wear, with hand crafted finishes on your glasses that would make the master jewellers sit up and pay attention. Personally designed, with add on finishes including semi-precious stones ,diamantes, hand etched emblems, and uniquely crafted patterns just for you, designed to your taste. You cannot obtain a more customised design than this. Be bold, and utterly unique with our collection of hand crafted eye wear. Designs to suit your mood, taste and circumstance. Faceted eye jewellery encrusted with gems. The stones are set in the optical lenses to maximize the amount of light bouncing around in the stone to catch the eye of the viewer. You may already wear hand, neck or bracelet jewellery, eye wear however becomes your defining feature as it is often worn all the time on your face for everyone to see. Treat yourself to this unique eye wear. These times we don’t spend much time appreciating artistic craftsmanship, but here we offer you both unique design and practicality thrown in for good measure. This eye wear provides both. Most of us will need to wear spectacles, once we reach a certain age. We think its wonderful that you can wear something so beautifully detailed and dainty, eye catching, and remain functional at the same time. 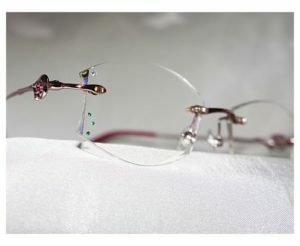 This eye candy brilliance is rare to find, as there are very few master craftsmen who will undertake the task of tampering with spectacle lenses to this degree. There is no room for error, no means of erasing mistakes, knowing their artwork will be there for everyone to see. At our Riverside Eye Care Optical Shop, we offer designs to suit your mood, taste and circumstance. See our collection, available upon request to you. An exhibit from our Faceted Eye Wear Collection is shown above.